Find Groom! Buy This Book! You're standing confidently at the alter, waiting for your turn to say "I Do," when sudden panic hits. Did you remember to review all the shots you wanted to get with your photographer? Did you remember to give the caterer the final guest count? Did you order that extra corsage for your grandmother? With this book, you'll ask the right questions, hit the right deadlines, and steer clear of disaster with plenty of time to spare. You'll find detailed checklists for every conceivable aspect of the wedding, as well as a detailed monthly organizer to help you make sure you're doing what you're supposed to be doing when you're supposed to be doing it. 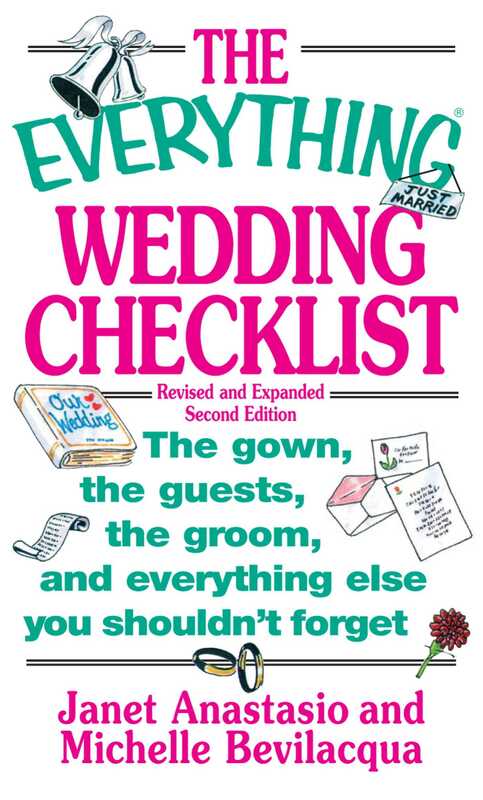 To steer clear of worries on your wedding day, you need The Everything Wedding Checklist. Elina Furman has written and cowritten more than twenty books, including The Everything After College Book, Generation Inc., and The Everything Dating Book. She lives in New York City and can be found on the web at www.boomerangnation.com.